Location, web-site navigation. You are here: PAHH : Memoirs and Histories : reprint, Greek Battalion's Valor Cited . ATHENS. The 187 Greek American volunteers, members of an elite unit of commandos who fought in Greece during World War II were honored last Thursday, May 26, 2005, in a simple but moving ceremony held at the Greek Ministry of Defense in Goudi, Athens. A memorial honoring Company C 2671 Special Reconnaissance Battalion, known informally as the Greek Battalion, was unveiled by Greek Defense Minister Spilios Spiliotopoulos at the Military Alsos Park sideways to the Ministry's building, in front of an audience of military officials, relatives of deceased volunteers and the remaining three survivors of the battalion. 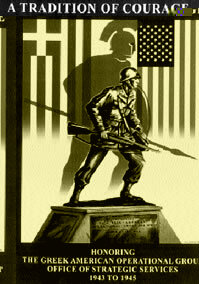 The Soldier Memorial Monument is a 1-meter bronze statue sculpted by noted California artist Mr. Andrew G. Saffas. It depicts a WWII soldier, alert and ready for combat. The statue is positioned on a 2-meter marble base, where a plaque is attached in the front commemorating the names of the courageous volunteers, and another in the back mentioning the names of the 50 Greek American individuals, groups and families, who contributed financially to the completion of the project. The event's most important attendees, battalion veterans Nicholas Cominos, Andrew Mousalimas and Angelo Lygizos, were joined in Greece by Mr. Saffas and Mrs. Sofia Johnston, president of the AHEPA committee which raised the necessary funds for the statue, an estimated $60,000. A National Herald story by Steve Frangos, published in last week's edition (page 1), mentioned that the unit, which entered Greece by parachute and amphibious landings in 1944, was founded by an executive order of President Franklin D. Roosevelt and was designated the 122nd to commemorate 122 years of Greek independence from Ottoman rule. The volunteers, a mix of Greek immigrants and Americans of Greek descent, came from Athens, Piraeus, the islands and rural parts of mainland Greece, as well as from American cities and towns. The battalion was "one of the best-kept secrets of World War II," Mr. Frangos writes, as the records of all Ethnic Operational Groups were not made public by the CIA until 1988. Mr. Saffas, 82, spearheaded the project in 1998, and completed it in 2003 after vigorous research on the era's military gear, which has resulted in a work of detail and poignant realism. On the morning of last week's ceremony, the sky looked ominous, and moments before the unveiling, a rainstorm threatened to postpone it. The rain came to a miraculous halt, however, to resume only after the ceremony's completion, as attendees withdrew inside the Ministry where a reception followed (the reception featured a presentation of a new book published by the U.S. Army History Directorate about the battalion). The rainstorm reminded those present of the harsh weather conditions its volunteers fought under. "I saw this monument in a dream six years ago," Mr. Saffas told the Herald after the event. "But I never saw this much rain in my dream." During the ceremony, Mr. Spiliotopoulos pulled the Greek flag which covered the statue to an extended applause. He then placed a wreath at the base of the monument, and a moment's silence followed in honor of the battalion's members. Mr. Spiliotopoulos then presented the three veterans and relatives of deceased battalion members, including its victims, with special honorary degrees. "It is my great pleasure to honor these three exceptional members of the Greek American Omogeneia, our brothers," the Defense Minister told the audience. "They are a living example of history. I congratulate them once more for having dedicated their lives, just like all Greeks who love this country, to the great ideals of democracy and freedom. The Greek people are grateful to you," he added. "The Omogeneia is one of the main factors contributing to our national strength. Today we paid tribute to the greatness of the Hellenism of the Diaspora by honoring those Greek Americans who fought for freedom and democracy, thus setting an example of patriotism for succeeding generations," Mr. Spiliotopoulos told the Herald after the event. "We are proud to be in our homeland today," one of the three veterans, Mr. Lygizos, told the Herald after the ceremony. "We thank the National Herald for being here to report this to our fellow Greek Americans." Among the event's prominent attendees were Steve Adamopoulos, representing AHEPA, and Deputy Minister of Defense Vasilis Mihaloliakos. "As a Greek American, I am very proud for today's ceremony," Mr. Adamopoulos said. "Greece's freedom and independence were achieved through the blood of generations of Greeks," Mr. Mihaloliakos added. Frank T. Blanas, Ronald J. Darr, Robert E. Eichler, Robert F. Houlihan, George W. Verghis, Gilbert I. Backman, George Chumas, John Giannaris, Paul J. Mackey, Michael P. Manusos, Donald E. Mort, George Papazoglou, Nicholas G. Pappas, Lon Peyton, Paul B. Pope, Theophanes G. Strimenos, Bernard F. Brady, Richard J. Daigle, Jr., Walter E. Gates, Apostolos G. Mihopoulos, Victor L. Miller, Peter M. Panagakos, Alvin G. Psinas, Christopher T. Saris, James J. Zevitas, Thomas K. Andrews, Jerry Apostolatos, James M. Apostolopoulos, Christ C. Christis, Harry Fergadiotis, Tom P. Georgalos, Mike C. Kountouris, George C. Kypriotis, Peter M. Laris, Steve J. Mastros, Peter M. Moshopoulos, Pete G. Paidis, Sam C. Poulos, Lyle M. Schneeberger, Anthony J. Serelis, James A. Thomas, John Bichekas, George G. Boosalis, David J. Christ, Nick H. Cominos, George M. Efstathiou, Steve J. Gineris, Dionisios Fotinatos, Demetrius Frangas, Paul N. Frangis, Alexander G. Gewlas, Andrew G. Grevis, Alexander Haritakis, George Hillias, Angelo H. Kaleyias, George S. Kalliavas. Demetrios G. Kamvouris, Andrew G. Karabatsos, George E. Katsaros, Alexander C. Katsias, Constantinos S. Katsikis, George N. Keramas, Gust Kitakis, Mihail G. Kondos, John M. Koutelis, Rudolph R. Kosisek, Peter Kurchock, George J. Kutulas, Trifon E. Lefakis, William Leonardos, Charles Liarakos, Christ G. Loulas, Angelo N. Lygizos, Lambros G. Makris, Theodore N. Markides, Steve P. Marthiakes, William G. Mehilos, Harris R. Mill, John P. Minogianis, Gus Nanos, Alekos X. Orkoulas, Gregory M. Pahules, Gus L. Palans, Nicholas D. Papapanu, James Papavassiliou, Spiridon B. Papayannakis, Peter C. Photis, Eleftherios J. Pipinias, John T. Pirpos, Bill Portolos, Georgios P. Portolos, Alexander C. Porysees, Theodore J. Poulakos, Arris Poulos, Martin Redovian, Norbert F. Rennie, Konstantine A. Salaris, Anthony G. Sampatacacus, Steven F. Segeti, Jr., Harry Shiomos, Christ Skiriotis, Peter Stamates, George J. Stathis, Minas C. Kavallieros, Bill G. Kirtatas, George J. Papastrat, Stephanos J. Philippides, Harry J. Pulos, William G. Seremetis, Steve Voulgarakis, Joseph C. Ciras, William S. Hortos, James S. Kavourhas, James A. Laubs, Dean M. Lowdermilk, Arthur D. Papoulias, Armando Sanches, Spiros T. Taflambas, Joseph F. Zien, James M. Zonas, John Bitsikas, Photios G. Doukas, Tasos J. Gianiotis, William Johnson, Gust C. Kraras, Louis G. Lenares, Pete H. Lewis, Anton Loukas, Andrew S. Mousalimas, Gust Mukanos, Alexander P. Phillips, Perecles P. Phillips, Spero Psarakis, Alexander Psomas, Nick E. Ramoundos, Hercules J. Sembrakis, Costas A. Theodorou, Paul J. Zarras, Arthur J. Agoritsas, James K. Alexatos, Harry T. Ameredes, Nick J. Amigdalitsis, Charles P. Antinopoulos, James Antonakis, Anargyros Antonopoulos, Gust J. Babalis, Constantin S. Bertakis, Aristides J. Boutselis, John C. Cacavias, Stavros E. Caragian, James Caroulis, James T. Drake, Cus Eliopoulos, George S. Tiniakos, Michalis Tsirmulas, Gus Vellios, Sotirios G. Vakakas, Nicholas A. Vanikiotis, Constantine Zahariades, John G. Glaros, George C. Karakitsos, Demetrios N. Polyzos, James A. Tsolas, Alex Vellis, Eleftherios T. Tsantes, John E. Tsouderos, Evangelo Agelopas, George J. Pappas, Thomas P. Soullas, John G. Katsikos, Paul Siapicas, Peter G. Anton, George T. Basiardanes. AHEPA 171 Daughters of Penelope, Ascension Cathedral of Oakland, Katina & Athan. J. Andronicos, Katina & James H. Andros Family, Anargyros Antonopoulos Family, Frank T. & Kay Blanas Family, Jerry & Joanna Carbone, the Gus J. Carkonen Family, Nick. C. Chiotras, Steve Manuel Clikas, Louis Katina Colombotos, Nicholas H. Cominos Family, Ted & Kay Cuclis, Alta D. Davis, Denise Ann Denker, George & Christine Eleopoulos, Daniel T. & Cynthia First, Nikos Demetrios Gassoumis Family, Nick & Mary Giannopoulos, Pete George Glenos Family, John & Gene Glenos Glynn, Mrs Anna Panos Guy, Sedgie W. Guy Family, Eleni Jannings, Family of Tom G. Javara — U.S. Navy (KIA 1944), Daisy Jerome, Sophia Tsouloufas Johnston, George & Anna Kanstantopoulos, Gust C. Kraras Family, Daughters & Son of C. Kyriakos, George John Lekas, Gust Meniktas, Jeffrey Montgomery, Mary & Andrew S. Mousalimas, Tom & Krissoula Natsues & Family, Gus P. Panos, Panagiotis E. Paraschos Family, Sophia & George Paris, Nicholas, Anna, Gus & Marie Petris, Alex P. Philips Family, Peter & Koula Photis & Sons, Linda, Irene & Vivian Portolos, Georgios Portolos Family, Luke Postolos, Mary Saffas Ross, Nikie & Andrew G. Saffas, Alex & Faye Spanos, Soy & Nick Tamaras, George H. Thodos, Nell & James Tsolas, George A. Tsouloufas Family, George W Verghis, Nicholas S. Victor & Dimi & Family. Zoe Tsine contributed to the above story. "The Greek / American Operational Groups' Valor Cited as Statue is Unveiled in Athens, Greece", by Andrew S. Mousalimas, a veteran who was honored — description of events in Athens, May 26-27, 2005, published as an Addendum (2005) in Greek / American Operational Group Office of Strategic Services (OSS), Memoirs of World War 2 (PAHH, 2004). 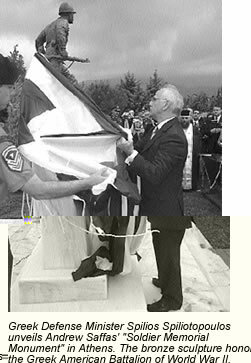 Hellenic American Veterans Memorial, Model of the Bronze Sculpture, Unveiling by the Sculptor (PAHH, February 1, 2003). Korkas, Constantine, Gen. ret., The Greek-American Volunteers in the National Resistance, History of the Operations in Greece of the 2671 Special Reconnaissance Battalion (23 April - 20 November 1944) , Military General Staff, Department of Military History (Athens, 2005). Κόρκας, Κωνσταντίνος, Ανγος ε.α., Οι Ελληνοαμερικανοί Εθελοντές στην Εθνική Αντίσταση : Ιστορικό των Επιχειρήσεων στην Ελλάδα του 2671 Ανεξάρτητου Ειδικού Τάγματος Αναγνωρίσεων (23 Απριλίου - 20 Νοεμβρίου 1944) , Γενικό Επιτέλειο Στρατού, Διεύθυνση Ιστορίας Στρατού (Αθήνα, 2005). The surname Eleopoulos for the donors George & Christine Eleopoulos was spelled as "Cleopoulos" in the original article. The correction has been made in this reprint at the request of Mr Eleopoulos. Malaspinas, Christos, Greek Battalion's Valor Cited As Statue Is Unveiled , The National Herald (June 4, 2005); reprint PAHH, 2005, available at http://www.pahh.com/remembrance/reprints/soldier-monument.html. Copyright © Christos Malaspinas, The National Herald (2005). Reprint by PAHH, 2005, with permission from The National Herald . Web-page Accessibility, Compliance to W3C WCAG 1.0 Levels AA-AAA. You are here, PAHH : Memoirs and Histories : this reprint, Greek Battalion's Valor Cited .